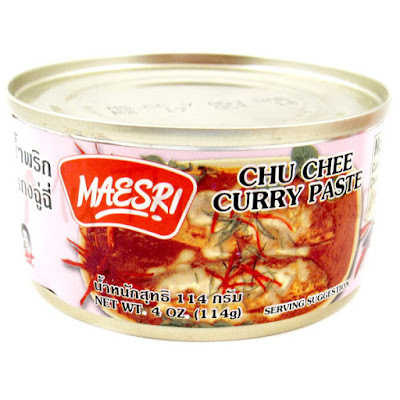 This is one of my favorite Thai curries. I first had it in the south of Thailand in Surat Thani at the bus station on my way to Phuket. It had every kind of seafood imaginable. Some of the seafood had been grilled, so it was epic. My version is much simpler, and although it sounds a bit involved, it really isn't. Just have everything ready to go and you will be rewarded with a wonderful meal which is bursting with flavors. Feel free to add whatever seafood you like and if you are allergic to shellfish, it is just perfect with fish. Or, if you want to make it vegetarian, just add deep fried tofu or broccoli. 1 lb Fish, cut into 3 inch squares. I use cod. 1 4oz can Chu Chee Curry Paste, easily found in Thai or Most Chinese markets. 4 Thai Chilies, whole or chopped, if you like it very spicy. Fresh Kaffir Lime Leaves, lovely if you can find them. Prepare your fish and other seafood and heat the oil in a large sauté pan which has a lid. Once the oil is hot, add your curry paste and keep stirring. After it is fragrant, add your fish and lightly sear each side. Maybe 1 minute per side. Remove to a plate and add your Thai chilies. Stir for maybe one minute. Then add your coconut milk and sugar and cook on a medium simmer for 5 minutes. Add in your fish, shrimp and scallops and make sure they are well coated with the sauce. Reduce the heat to a soft simmer. Put on the lid and cook for 6-7 minutes. Turn off the heat, add the fish sauce, kaffir lime leaves and lime juice, mix well and serve over steamed Jasmine rice. Vegan Fish Tacos - No Guilt!